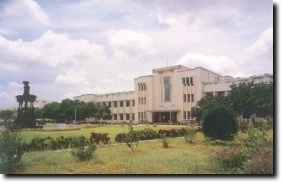 Nachimuthu Polytechnic Established in 1957 in Pollachi and named after the founder, the polytechnic offers Diploma courses in several Engineering disciplines like Civil, Mechanical, Electrical, Computer Technology, Electronics & Communications, Textile Technology, Automobile, Refrigeration & Air -Conditioning, Information Technology and Commercial Practice. And it offers Post Diplomo courses in Automobile Engineering, Industrial Electronics, Industrial Engineering and Computer Applications. The Goverment of India accorded the status of Community Polytechnic to the institution in 1986, and in this capacity it trains rural youth in need-based technical trades and transfers appropriate technology to rural areas through non- formal educational channels. The Institution is jointly financed by the State Goverment and Nachimuthu Industrial Association. Pollachi 642 003 - India.